No workable step-by-step yet. See comments. Plug and play. External monitor works via Display Port. Internal display works. Install Windows 10 with Bootcamp Assistant. In Windows, download and extract DDU [ home | .exe ]. In Windows Safe Mode, remove AMD & NVIDIA drivers using DDU. In macOS, download and extract the latest version of rEFInd (0.11.0+). Boot into macOS Recovery Mode by holding ⌘R right after turning on the MBP until the Apple logo appears. Open Terminal, located under Utilities in the menubar. In the EFI volume in Finder, open the EFI folder, then the refind folder. Then open refind.conf in a text editor. Find the line that has "spoof_osx_version" in it and delete the "#" in the beginning of that line. Probably around line 463. Boot into Windows by pressing W on the rEFInd boot screen. In Device Manager, disable the Thunderbolt 9D18 controller. Plug the eGPU into the lower left TB3 port (closest to TAB). Download and install Adrenaline 19.2.2 from BootCampDrivers [ home | download ]. The official AMD download may work too but I didn't try. Download and install the following Gigabyte utilities: AORUS ENGINE and VGA Tools. This is very much a work in progress. I'm completely stuck at the moment, but will update this post accordingly. I hope incomplete or failed builds can find a home here too. I read that this box is pretty much plug and play with macOS, so I hooked the eGPU up to power with the provided cable, to my monitor (AOC 24P1) via Display Port, and then to my MBP with the provided TB3 cable to the top left port. At this time the MBP was in sleep mode and not connected to anything else. Immediately the MBP woke up, the eGPU LEDs lit up with fans spinning, MBP started charging, then the screen froze. Only moving the mouse was responsive; keyboard, touch bar, and mouse clicks were not registering. I disconnected the TB3 cable from my MBP and the system went black with some text saying there was a system error and the system will now restart. When booting up the with eGPU plugged in, the boot up freezes — black screen with the white Apple logo and white progress bar halfway. If I unplug the eGPU, boot up will resume. If I plug the eGPU back in any time after this, the system will eventually freeze either at the login screen or at the desktop. I once saw a No GPU Detected notification in the corner. I've tried with all 4 USB-C ports, without the external monitor, with another TB3 cable from the Mantiz Titan... No matter what, the system freezes. Meanwhile the eGPU is powered with the lights on and fans spinning. I don't have boot camp installed, but I'll get to that in the coming days. Fingers crossed I find a way to make it work. At worst, I'll get a replacement box or just a refund and try another eGPU. With eGPU plugged in, boots into Recovery Mode just fine. No screen freeze or crashes. However, when connecting an external monitor to the eGPU, the external monitor's display is glitched. 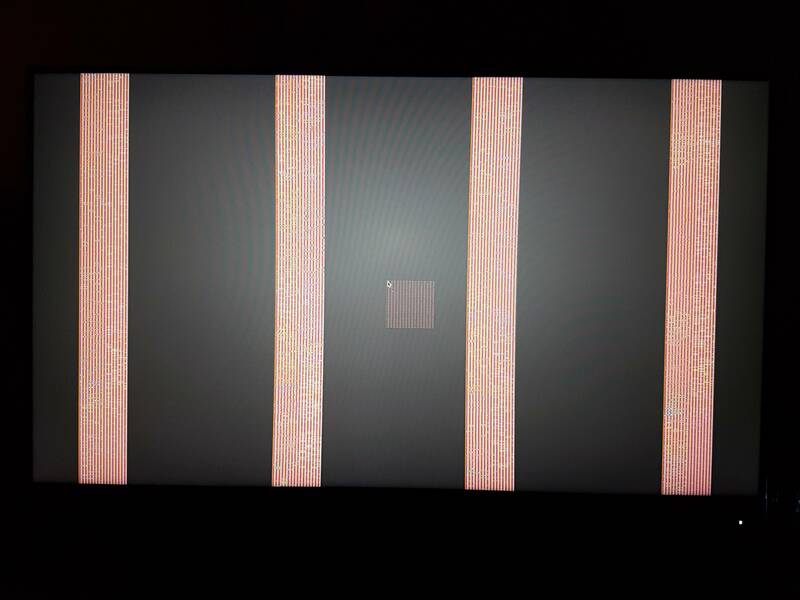 I've seen similar glitches with my 2011 MBP and Mac Mini due to GPU issues. I'm quite sure something similar is going on here that the eGPU is somehow faulty. This is how it looks like. The square block follows the mouse cursor. When I drag a window to the monitor, it appears behind the white bars. No improvement at all after re-installation. Everything is as it was in my previous attempts. I did the usual: install Windows 10 using Boot Camp, remove NVIDIA and AMD drivers with DDU, install rEFInd and edit refind.conf to spoof os x, plugged in the eGPU and install the AMD driver from Gigabyte support. Results are inconsistent except that ultimately the eGPU is unusable. Booting Windows with the eGPU plugged in usually causes the boot up to hang. Boot up resumes normally after unplugging the eGPU. Plugging the eGPU back in any time after this yields similar results as macOS – a mostly frozen display except for the mouse, sometimes a black desktop and only the ability to right-click the task bar. After unplugging, Windows resumes as normal and the display refreshes itself according to whatever mouse and keyboard actions done prior. Sometimes the eGPU LEDs aren't powered and the fan is unusually quiet when plugged in. These times, the display doesn't freeze. And device manager gives an Error 12. Disabling the right-side TB ports doesn't help. Sometimes plugging it into the lower left port (closest to TAB) disables the trackpad. I got everything up and running after returning the Gaming Box and getting another one from Amazon. Installation steps above. The first Gaming Box was definitely defective somehow. It would cause my computer to crash in both macOS and Windows. My second one was plug and play with macOS. With Windows I had some problems setting it up. WiFi, the trackpad, or the whole system would sometimes crash. But eventually I got everything working well in Windows by using DDU to ensure all previous drivers were uninstalled, then installing the BootCampDrivers.com AMD Adrenaline 19.2.2 drivers and Gigabyte utilities. I've already had a couple instances of the "boot coup" described mar_kelp, where the rEFInd boot screen doesn't appear when booting up, preventing me from choosing which OS to use. To fix this, just repeat Steps 4 & 5. I'm using the eGPU USB ports with my keyboard and with my mouse RF receiver. So far I don't have any connections problems. There also hasn't been any problems with loud PSU fans yet. I'll update if anything else happens. It’s not “pretty much” plug and play it’s 100% plug and play in Mojave. Have you tried booting into into recovery and reinstalling macOS? Sorry, couldn't log in for the past week. Update after trying macOS Recovery Mode, re-installing macOS, and using Boot Camp. Long story short, no dice. Because of the glitches in Recovery Mode, I'm fairly certain the eGPU itself is somehow faulty. I will return the eGPU to Amazon and get a refund. Unfortunately Amazon no longer has it in stock, so I can't get a replacement. As for other enclosures, I can't quite bring myself to spend $500+ on another enclosure and an RX 580 that will undoubtedly be bigger and more cumbersome than the RX 580 Gaming Box, which I got for $400. I got everything up and running after returning the Gaming Box and getting another one from Amazon. Installation steps below.